When it comes to the weather we fishers are very hard to please. It can be too cold, too hot, too windy, too bright and even too nice. Depending on the type of fishing you want to do and when you can fit it in, conditions are seldom right and if they are then the exception is ‘It winnae last’. Last week was a case in point when we went from sunshine to thunderstorms, but the fish ignored the doom and gloom. It succumbed to many a different fly as the returns book showed. Peter Young charged between diawl backs and small lures and was rewarded with 20 fish for his all day session. Ronnie Ewen fished Kate McLaren’s and snatchers and brought 18 fish to the net. Colin McDonald fished patiently with only buzzers and he got 14 fish as did Dave Lawrence from Peterhead who used lures and cormorants to get his tally. 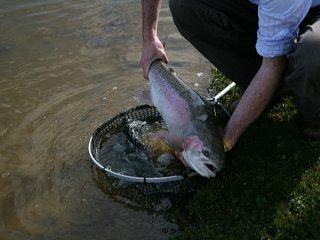 Top of the water flies also did the trick at times with Paul Ingram having 10 fish on daddy’s & CDC’s. Duncan Gerrie had a particularly satisfying session when he landed 9 fish on a foam emerger fly he tied himself which he now calls the “Slam Dunc”. Mike Duncan from Newmachar on an evening session used an assortment of size 16 black dry’s along with white moths to get 9 fish and Trevor de Almeida had 7 fish on dry’s and emergers. Our next competition will be the ‘September Singles’ on Sunday 17th September, there will be lots of prizes to be won on the day and there is always a good bit of banter and friendly competition to be had.